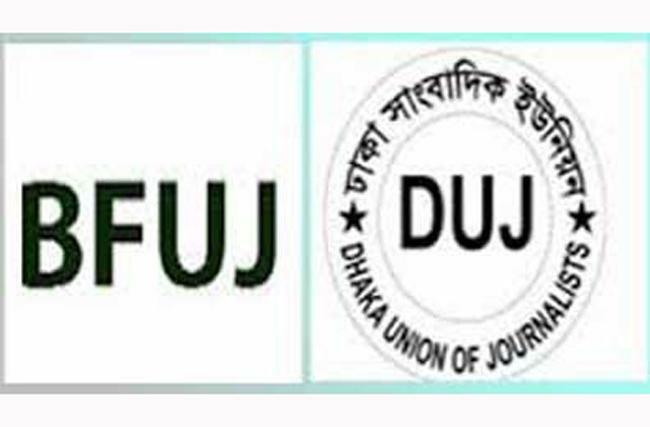 Bangladesh Federal Union of Journalists (BFUJ) and Dhaka Union of Journalists (DUJ) have asked Jatiya Oikya Front convenor Dr Kamal Hossain to publicly apologise for misbehaving with journalists. They also condemned such uncourteous behaviour shown by Kamal Hossain to on-duty journalists at Martyred Intellectual Mausoleum at Mirpur in the capital on Friday. It is unfortunate and unacceptable that Kamal Hossain abused and intimidated reporters, replying to a query about his political alliance with anti-liberation organisation Jamaat and war criminals, they said. In the statement, BFUJ president Molla Jalal and secretary general Saban Mahmud, DUJ president Abu Jafar Surjo and general secretary Sohel Haidar Chowdhury said Kamal Hossain violated freedom press by using audacious language to journalists. “A journalist has the professional right to making query to anybody on any relevant issue. Similarly, anybody has right to avoid question of the reporter. But the way Kamal Hossain abused and intimidated the journalists is unacceptable,” they added. The two organisations will hold protest rally at 11:00 am tomorrow (Monday) following Kamal Hossain’s ill treatment towards journalists. They also asked all other journalists associations across the country to hold protest rally day after tomorrow (Tuesday).